When I was laying out the menu for this week, I glanced at our schedules for what would be happening today and noticed we were going to be stretched thin. While I knew we would have leftovers in the freezer if it looked like I was going to run out of time to prepare dinner, I still wanted to plan on cooking a fresh meal if life happened to allow for that. I had to make sure I was picking a dish that followed two guidelines - it needed to be quick to make and wouldn't leave a disaster to clean up afterward. I had two recipes in mind (one was shrimp and the other pork) and left it up to Jeff to choose as I had picked out everything else already, even though I knew he would jump for the shrimp dish. 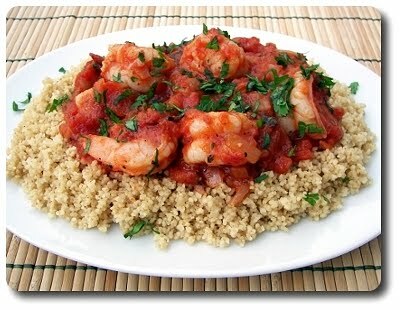 No surprise, he did, choosing this Shrimp in Spiced Tomato Sauce. The sauce is the star of this, but it may be more uniquely spiced than you are used to. While starting off with an onion is hardly unusual, what sets this sauce off onto another journey is the potent hit from minced ginger that's added at the same time. If you're using a fresh knob that you have just picked up from the market, a knife does the job just fine to mince it into pieces (and incidentally, a regular spoon makes removing the tough skin a breeze) but I like to store the ginger in the freezer (peeled first) and then use a coarse microplane to make short work of it. Not only does it keep for quite some time that way, it is already prepped and ready to go whenever I need a shot. When the onion had softened, ramping up the sauce continued by stirring in ground coriander, cayenne pepper and a hint of brightness from a bit of lemon zest. Tomatoes went in next, using a large can of whole, peeled to keep the quick-to-make theme going - just break them up with your hands as you add them into the pot. Once the sauce had a chance to simmer, allowing the spices to permeate throughout the pot, taste and season fairly aggressively with salt and fresh ground black pepper. Because the shrimp are tossed into the sauce unseasoned to cook, you need the extra dose to make sure the little guys perk up. 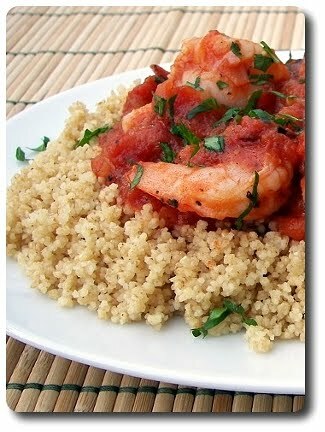 Only taking a couple minutes in the steamy sauce to cook the shrimp through, we served this saucy dish over a bed of warm whole-wheat couscous with a smattering of fresh cilantro on top. The fragrant note of ginger and coriander was a little striking at first bite, but the more we ate, the more we couldn't stop! Don't shy away from the cayenne pepper - if you're worried about heat, the amount in the sauce lends just a bare whisper, rather than an intense burn. 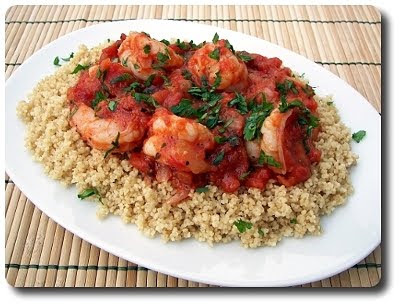 On the chance you like to prepare meals in advance for easy dinners, you can do most of this dish ahead of time - prepare everything just to the point when the recipe calls for adding the shrimp. Let the tomato sauce cool to room temperature, place the peeled and deveined shrimp (if the peeled shrimp are frozen, leave them that way to begin with) into a gallon-sized zip-loc style bag, then pour the cooled sauce on top. Remove as much air that you can to seal, then store until needed. To cook, let the bag thaw in the refrigerator overnight, then pour the mix into a medium saucepan and bring up to a rapid simmer. Let the sauce continue to bubble until the shrimp are just opaque throughout (this should take about 3 minutes or so). Besides family, when we moved out to North Carolina, one thing we knew we were going to miss was the yearly tradition of going apple picking. You've read about our trips before and how much fun we had on them! 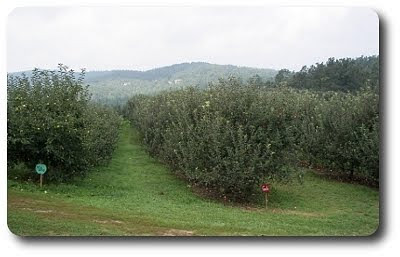 After snooping around though, we found that there are several apple orchards just a scant two hour drive from our new house here in Charlotte - score! 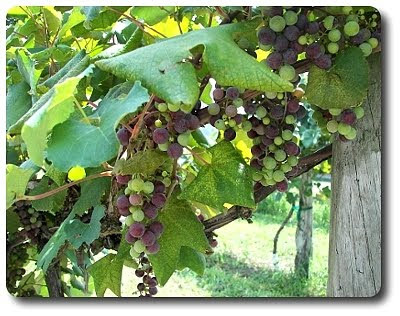 Usually, we would have to wait until late September or early October back in Minnesota for picking, but here? 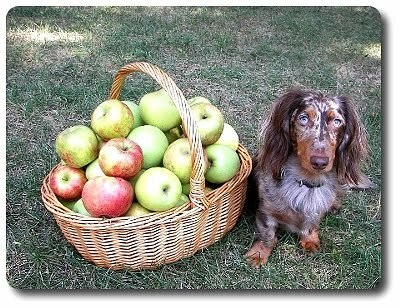 The apples are ready, now! 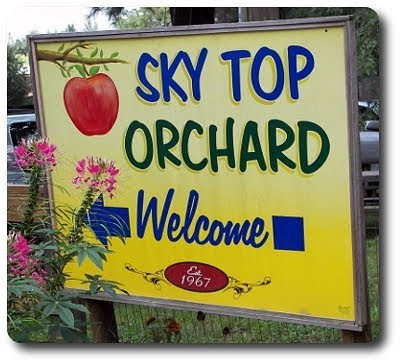 Here is one we went to today... Sky Top Orchards, located in Flat Rock. Upon getting out of the car, you had a sign with rules... I guess they had problems with apple throwing in the past? 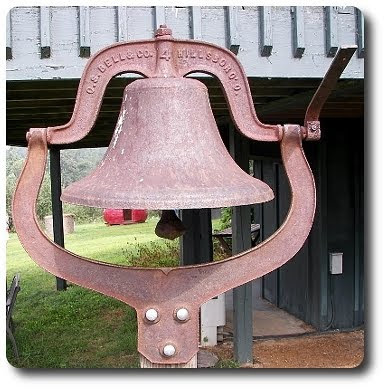 The next item we came across before we ventured out into the trees was this fun bell... you can hear the bong it made from a fair distance! Here's Gus and I with an empty bucket - you can see I'm intent on filling it up! 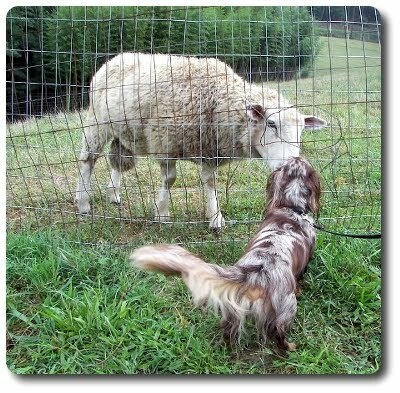 Also, animals were abound and Gus couldn't get enough of this one! 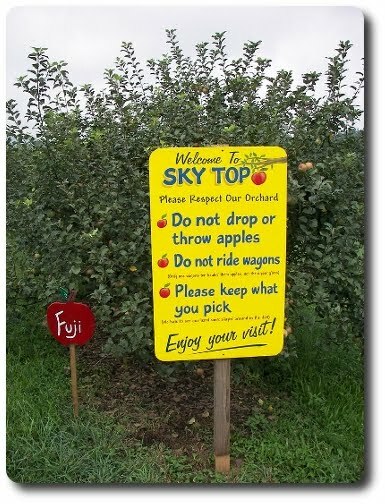 One container filled, with Honeycrisp apples - go us! 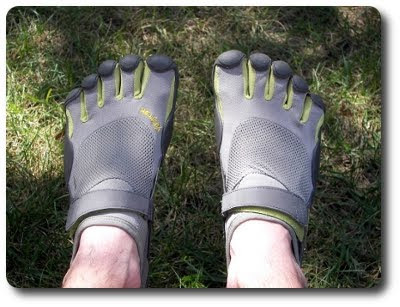 They are called Vibram Five Fingers - I'm transitioning to barefoot running and these are the closest you can get to being barefoot, but still have your feet somewhat protected! I'm running barefoot, but use these for errands and whatnot. You may not think so at first, but I have to say, these are so much more comfortable than shoes EVER were for me. 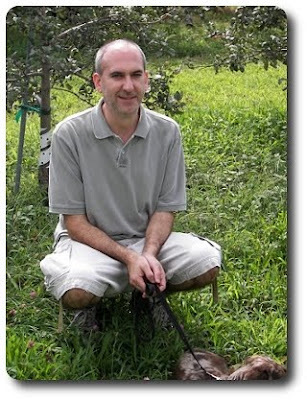 My knees have thanked me too. They are definitely also a conversation starter! 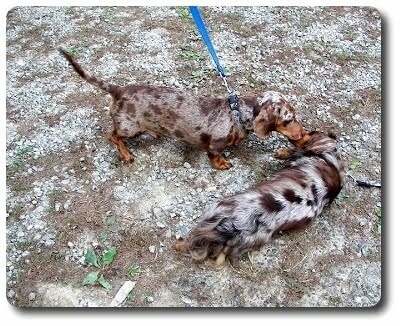 Gus's short-haired twin! Crazy! They had never seen another one that looked like their pup. We went back out to look around since the apples were in the car and Gus wouldn't cooperate when Jeff got his picture taken - see him hiding in the corner? However, he was fine with me when we were at the top, overlooking the lovely view! Guess he picked his favorite... hee hee! 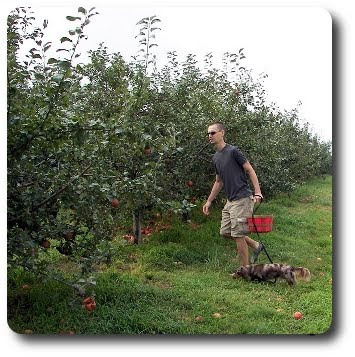 All said and done, we picked just shy of 30 pounds (coming to just about $1 a pound, by the way), with the majority of them being Golden Delicious, Fuji and Honeycrisp. While we still miss being able to pick with our family, it looks like we may have just started our own new tradition out here! We've been doing this Friday Pizza Night for some time now, but I couldn't recall just when we begin... when I went to go see just how long, I was shocked to see it has been over two years already! We started our first pizza night back in July '08 with that Nectarine and Prosciutto Pizza, though I was not sure at the time we would stick with it, but I'm sure glad we did! 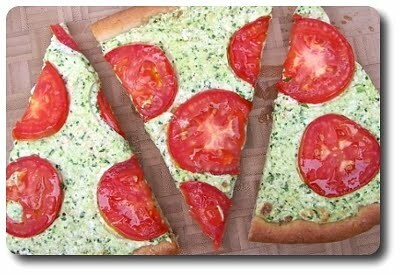 I thought it would be harder to come up with new pizzas, but this palate seems to be pretty endless in variations. In this week's rendition, Arugula, Ricotta and Smoked Mozzarella Pizza, you'll find a mess of cheeses, a crisp crust and garden fresh tomatoes (though, not from my backyard!) on top. Using our homemade whole wheat pizza dough as the base, we massaged the stretched-out round with just enough extra-virgin olive oil to coat, then eased the glistening dough onto a heated baking stone (which has weathered these two years well, seasoning itself a little darker with each use) to give the baking process a jump start. If you like a softer crust, you can skip this pre-bake. 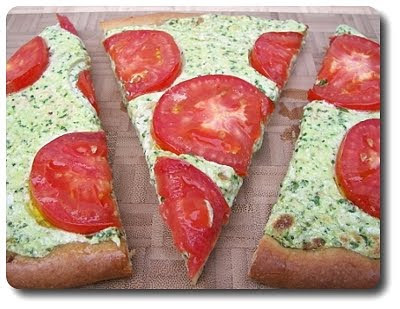 If you used a food processor to make your dough (which, again, is such a snap to do if you haven't tried it! 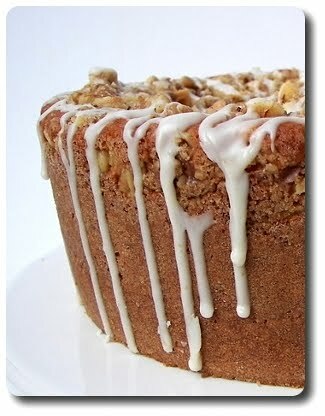 ), don't bother cleaning it - just give it a quick wipe or rinse as you'll be using it to make the topping. Ricotta, garlic and salt are whirled around first, smoothing the soft cheese out, followed by the second cheese - a liberal amount of mozzarella! However, this is not your ordinary fresh mozzarella; with this pie, you'll need the savory smoked variety - it makes all the difference here. Joining the cheese is a packed cupful of arugula - when you blend these two in, don't let the processor go full-boar... just pulse it a few times until it is combined, yet still chunky. With the partially baked crust taken out from the oven and cooled slightly, the cheesy concoction (now tinted green, thanks to the arugula) is spread all over the top, leaving a slight clean rim around the edge for a crunchy handle. With all that heaviness on top, thin slices of beefy Roma tomatoes are arranged on top to lighten up the load, along with adding a splash of color. For a little va-va-voom to the tomatoes, we took a couple more teaspoons of extra-virgin olive oil and kissed each slice with a few drops. Baked once more to warm the tomatoes through, finish crisping the crust and nudge the cheese mixture into a slick pool of goodness (yes, once again, that's how Jeff chose to describe this...), you'll want to be sure to give this a few minutes to rest before you divide the pizza into wedges. We used to use an old pizza wheel, but once we realized we were hooked on this weekly pizza binge, Jeff picked up one of those nifty pizza rocker blades for me and we haven't looked back - it works well for cutting bar cookies too! Since we didn't use a ton of arugula, I wasn't expecting much of it to come through against the forceful mozzarella, but its peppery kick still managed to show up. 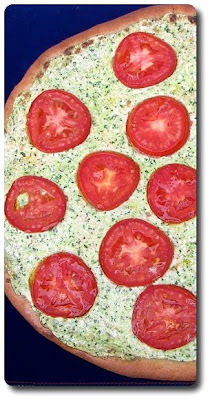 Jeff didn't know if he'd like the tomatoes on this and was ready to flick them off, but he gave it a shot and surprised himself with how much he enjoyed the playful dance between the smokiness from the cheese and acidic bite of the tomato slices. We picked up a container of sour cream a couple of weeks ago (hello sale!) with full intentions to bake with it, but as things have been going lately, life turned busy and it somehow managed to crawl back behind a few containers of Greek yogurt. I noticed it again when I grabbed one of those yogurts for a granola snack (which came from a new recipe I need to get posted!) Saturday before menu planning for the week. Sparking the baking fire again, I went searching for a way to use it for the Weekly Wednesday Treat Day item and came across this Sour Cream Coffee Cake that sounded way to good to pass up (and no, there is no coffee used... yes, we get asked that whenever we make these types of cakes!). The batter for this cake was like a big, overflowing bowl of clouds - light, billow-y and smooth, made using cake flour to ensure the cake will have a lovely tender crumb. I do recommend purchasing cake flour if you don't already have some handy - brands I've used numerous times before are Softasilk and Swan's Down, but I've recently just started using King Arthur's branded unbleached version and have found it works just as well, though the texture is not as ultra-fine. You could always try the common substitution of using all-purpose flour, taking out 2 tablespoons for every cup and replacing them with cornstarch, but I haven't personally used that method. 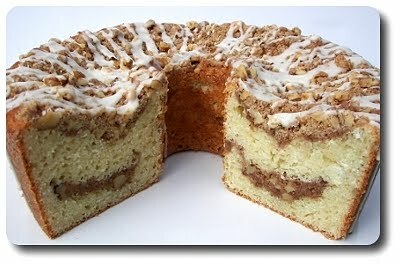 To give the cake some character, a crumbly streusel is scattered not only on top of the cake, but also used as a hidden layer inside. Half of the batter is spread into a tube pan, followed by the sugar-y crumbles made by working cold cubes of butter into a mixture of flour, brown sugar and cinnamon. 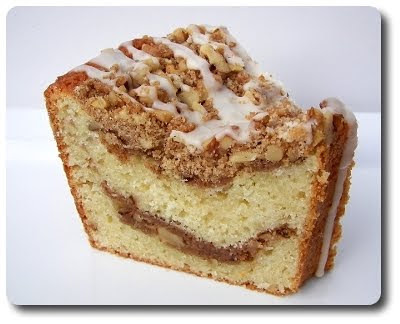 For a bit of crunch, walnuts are also stirred into the streusel - pecans would be a good choice here too. I did double the recipe from the original as who doesn't love a boatload of streusel, but feel free to cut those ingredients in half for a lighter touch. After the cake has baked and had a chance to cool, it easily released from the pan (have to love those two-piece tube pans for that reason alone), we had one more job to do before we called this cake complete - a snazzy maple-laced drizzle! All this entails is stirring together confectioners' sugar with enough pure maple syrup to make a thin enough glaze, which is haphazardly dribbled all over the top and sides. The sour cream made the crumb incredibly moist, but if you're not a fan of its natural tang, don't be concerned, it doesn't translate into the cake's flavor. 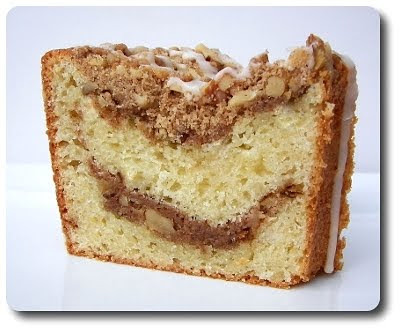 Between the rich brown sugar, cinnamon and crunchy walnuts, the streusel does play a starring role here, which made doubling it make sense, but it may have led to an issue I wasn't expecting. I am a little disappointed in how the cake rose - it was fine on the sides and center near the tube, but the center ring seemed to peter out and stall. 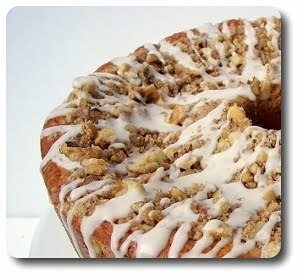 I'm going to guess it was the weight of the doubled streusel, but I'm not completely sold on that - any guesses out there? Saying that, Jeff and I both seem to think it did not affect the texture that much (it was a bit more dense than it probably should have been) and the flavor was still spot on. We're due for another catch up post as I try to work through a small mountain of recipes we've already prepared in these past few weeks. This pile sits next to me, whispering daily, wondering why they are being ignored... at least that's what it feels like as the pile gets larger, instead of smaller! When it was practically at a boil outside a few days ago (which, thankfully, seems to have subsided! Woo! ), turning on the oven for dinner was definitely not on the menu. 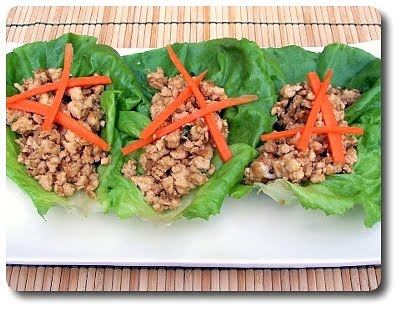 With a pound of ground turkey in the fridge thawing, these Stir-Fried Turkey in Lettuce Wraps were definitely the right way to go! Fish sauce, soy sauce and sugar is used not only to moisten the chicken as it cooks, but it also made for a pungent, sweet drizzle over the top of the assembled wraps! Flavored with fresh ginger, garlic and a small serrano chile (seeded or not, your call), feel free to swap out the meat if turkey isn't on your radar - try pork, beef or even ground chicken. 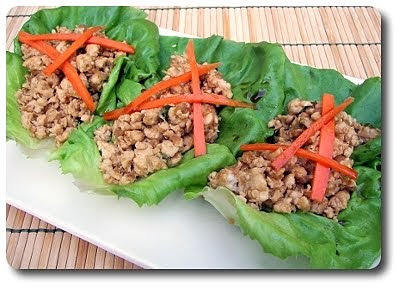 Crisp lettuce cups worked well for us as a lighter option, but this would also make a dynamite sandwich filling stuffed into a hallowed-out baguette! While that stir-fry was light, this next dish, Barley Risotto with Garlic, Spinach and Mascarpone, was decidedly more in line with a heavier, comfort food-type meal. I guess this should be labeled "risotto-style" or maybe even "barotto" as regular risotto is usually made with starchy arborio rice - however, you can still replicate the process using whole-grains too, like barley, farro or even steel-cut oats with success! Jeff and I both loved the lemon zest in this - it came across exceptionally bright, breaking through the richness with its clean zip. 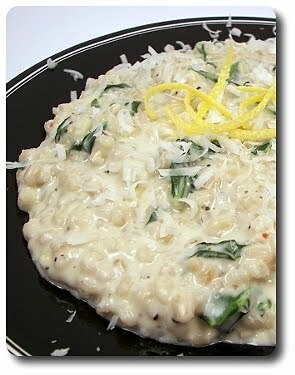 You do still get the cheesy bite you expect in risotto from the Parmigiano-Reggiano used, but what makes this dish exceptionally creamy is a generous dollop of mascarpone cheese. This triple-cream chesse is mellow, with a luscious, buttery tone, and makes this just that more special - you could probably get away with cream cheese in a pinch, but mascarpone is worth seeking out. 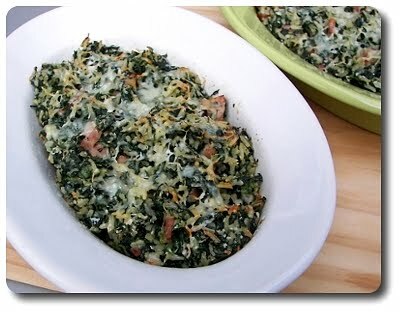 We made this next recipe, Spinach, Rice and Ham Casserole, in individual baking dishes, but you could also toss it into a single pan to bake. Use white rice if you like, but since I keep bags of already cooked brown rice in the freezer, we used a couple cups worth of that. I like to make big pots on the weekend using our favorite no-fuss method, then freeze them in portions to pull out when needed - little things like this make life much easier on busy nights! There was nothing exceptional to shout out about this, besides the nutty Gruyére cheese that is, but it was a breeze to make and since we both enjoyed it, I would make it again. As you know with our weekly Friday Night Pizza's, we tend to stick with our trusty whole-wheat pizza dough - it's non-fussy, easy to roll out and tastes good. 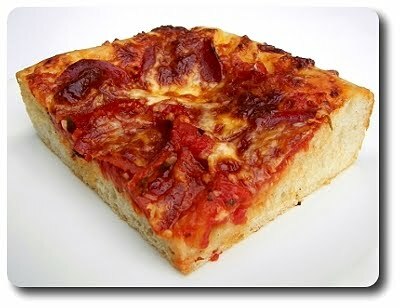 With tonight's pizza, we decided to stay close to the recipe for the dough this Pepperoni Deep-Dish Pizza called for. While there isn't much work to bring the dough together, it does need to be made a day before as it will slowly work its magic in the refrigerator for 24 hours. So, while we didn't get the almost-instant gratification of the dough we usually make, the turtle rise in the fridge works to the dough's advantage by the boost in flavor and texture. 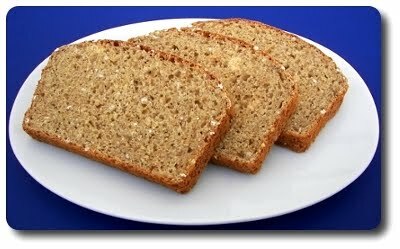 We used instant yeast, which is how I wrote the recipe as it allowed us to skip the step of blooming active dry yeast. However, if you only use active dry, you'll need to prepare the dough a bit differently. 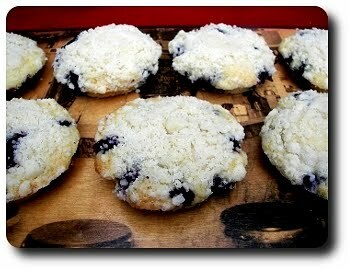 Instead of following our directions, mix the flour only with 3/4 cup water and set it aside for the twenty minute rest. Five minutes before the rest is over, mix the yeast with the remaining 1/4 cup water and when bubbly, stir the bloomed yeast, oil and salt into the flour mixture and continue on with the recipe directions. 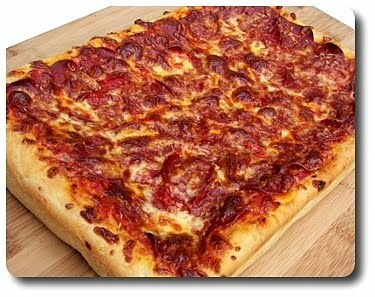 When you're ready to use the dough the next day, let it come to room temperature before you start to man-handle it. 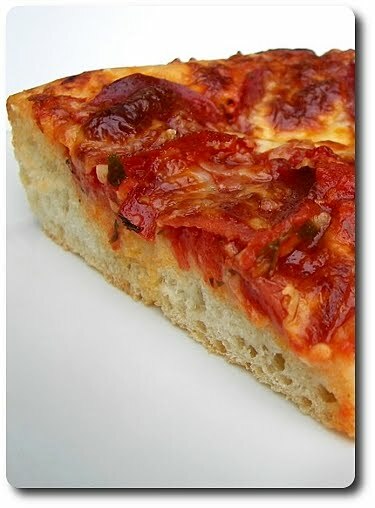 It should take about an hour or so, which just happens to be enough time to prepare a homemade pizza sauce with a special ingredient, San Marzano tomatoes! These tomatoes, a variety of the more common plum/roma version, are usually more expensive (which I realize can be a turn off for some - we paid just over $4 for a 28 ounce can), but they come with a stronger tomato-y flavor and run sweeter with a less acidic bite. Starting with a warm pool of quality extra-virgin olive oil, several cloves of minced garlic are added and when their fragrant aroma hits your nose, the tomatoes, crushed first, and any juice with them, are stirred in. Salt and dried oregano (rub the leaves in your palm to release its essence) season the sauce and when brought to a boil, the heat is turned down to allow the sauce to simmer at a quiet bubble. Take the time and let this concentrate down until it is no longer water-y looking and measures roughly 1 1/2 to 1 3/4 cups, which should take just over a half hour or so. You can do this a day or two ahead if you like, too. Rolled out to a size larger than the baking pan, we tucked the supple dough into the pan, then pressed it slightly up the sides to make for a thick, decidedly chewy outer ridge. After being roughed up, the dough is covered and rests for the final time (I know, I know... lots of steps for just a pizza!) while the oven comes up to temp. With the crust being extra thick and using a pan to contain it, to ensure the bottom of the crust gains enough crispness, stick a baking stone (you could use a baking sheet in lieu of a stone) on to bottom shelf in the oven to heat up as well. Before spreading the cooled sauce over the dough, a mess of mozzarella went on first (leaving a cheesy layer protected from the fierce oven heat), followed by as much of the sauce as you like, a wealth of pepperoni, salty Parmigiano-Reggiano and a bit more mozzarella, just because. I did find that while baking our topping got a little darker than I would have liked to make sure the dough was baked all the way through - if you find that's the case for you two, you could try tenting it with foil turning the last few minutes (I didn't check early... oops!). It may look iffy to portion out servings, but this slips right out of the pan, making it a breeze to cut into hefty, hunger-pain quenching squares. I think it's safe to say we are going to dig deep and satisfy any chocolate desires in this week's Wednesday Treat Day. 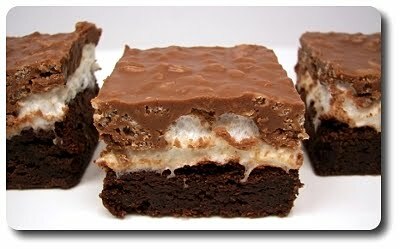 We smashed not one, not two, but three types of decadent chocolate into these insane Marshmallow Crunch Brownie Bars! The first two types of chocolate, unsweetened and bittersweet, are combined by heating them together with butter until the mixture has become smooth and combined. We did this on the stove over medium-low heat, but I don't see why this can't be zapped in the microwave - just be sure to stir often so the ingredients are evenly heated. 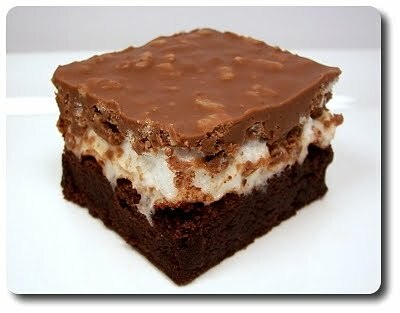 To bring the chocolate a little more to the forefront, I did spike it with a half teaspoon of instant espresso once it was melted, but you can leave this out if you like. This dark, slick business needs to be set aside to cool briefly - how come? You'll see! Granulated sugar, eggs and vanilla are the second half of the wet ingredients, which are then combined with the above melted chocolate. This is why it is allowed to cool for a few minutes - no one wants bits of scrambled eggs in their brownies! With the dry ingredients (flour, baking powder and a bit of salt) stirred in, the brownie batter gets one more hit of chocolate... in the form of chopped chunks! Yes, chips are fine too, but I used a large bar (rated about 60% for bittersweet) we had in the pantry. 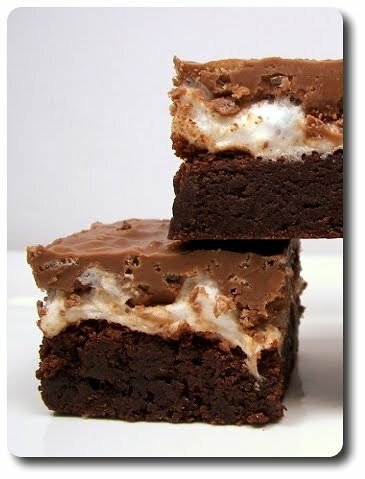 As soon as the brownies come out from the oven, the top is scattered with miniature squishy marshmallows, then slid back into the heat to melt the 'mallows together. The final funky addition to these bars is made simply from chopped milk chocolate, melted together with creamy peanut butter and a knob of butter, followed by an overflowing cup of Rice Krispies. This mixture is fairly loosey-goosey (nothing like the Rice Krispie Bars), so it is best to spoon this over the top, then gently spread it all together - if you just dump it in the middle and hope to spread it around, you'll be left with a sticky mess as it will sink and start to combine with the soft marshmallow layer below. There are a couple hours of misery that happens with these bars as you need to chill the entire precious flat until it is set and firm - tough, believe me I know as it was hard to resist the overwhelming chocolate scent that floats off these. Besides making it easier to cut, giving them the time to rest in the fridge allows the layers to bond and become cohesive. It will be worth the wait! 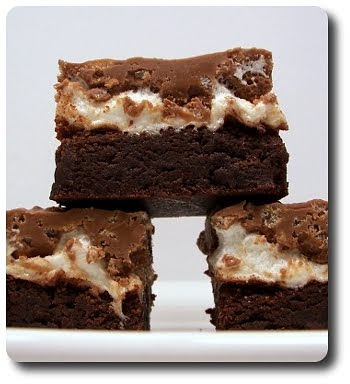 Not only do these bars get an A+ for taste, but the contrast between the dense, fudgy brownie base, light, gooey marshmallow center and the creamy, yet crunchy peanut butter-laced chocolate krispie concoction on top deserved an award by itself! Make them as large or small as you want, but we found 24 to be good compromise - enough to feel indulged, yet not so much you feel like going comatose. 12 would be good for those extreme chocoholics, while 36 would give you a small, two or three bite treat. If you have a favorite boxed brownie mix and you're in a rush, you could always take that short cut and hasten this along, picking up the recipe at the point you add the marshmallows. I usually have oatmeal once or twice a week in the mornings for breakfast - more often in cooler weather for sure, but I find I still enjoy it during the warmers months as well. 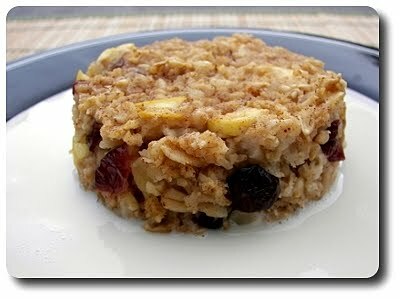 When we were thinking of a breakfast-for-dinner night this week, oatmeal popped into my head, but that didn't sound all that exciting until I remembered I had saved a recipe for a more unique way to prepare oatmeal... by baking it! While most of the work is taken care of in the oven, there is a bit of prep work to get this Baked Cranberry-Apple Oatmeal ready. We are using a mix of oats here, the tiny steel cut pellets and old-fashioned rolled, however the former need a quick pre-soak to be softened as they are quite crunchy! The nuggets are steeped in a hot mixture of apple cider (juice is fine too) and water, along with a big knob of butter. Once those oats have lost some of their rugged exterior, the rest of the dry ingredients are stirred in - the regular oats, a chopped apple (we went in the tart direction, using a crisp Granny Smith), dried cranberries, crystallized ginger, cinnamon, baking powder, fresh grated nutmeg and for an alluring whisper of spice, a touch of cardamom. Whew! I know it seems like a fair amount of ingredients for just oatmeal, but stick with us - it'll be worth it! To gather all those ingredients and hold them together, an egg, milk and a few drops of vanilla are swirled together and join the moistened oats. 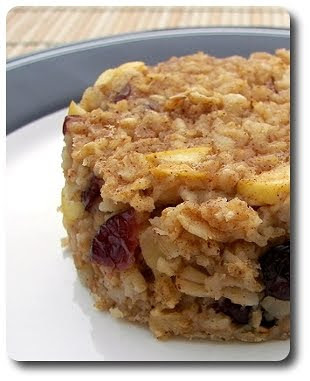 Bake this until the oats have absorbed the liquids and the center is set and just firm to the touch. If you serve this hot right out of the oven, it will be fairly spoon-able, almost pudding-like in texture, but if you let it cool for just a few minutes, you will be left with a firmer, slice-able oatmeal (cut-able into shapes, too! ), which you can either enjoy as-is or with a splash or two of milk as we did. With the apple cider and brown sugar, I did find this to be fairly sweet (though Jeff thought it was just right), so if you don't groove on a bunch of sweetness in your oatmeal, think about dropping a tablespoon or two off the brown sugar. This stores well in the refrigerator or the freezer, and can be quickly warmed back up with a zap in the microwave. Or if you're feeling adventurous and frisky, take a slice of the chilled oatmeal and instead of heating it in the microwave, brown the slab in a skillet with melted butter and top it off with a scoop of creamy vanilla ice cream! Being fairly versatile, feel free to experiment to your hearts content - for blueberry oatmeal, drop the apricots and switch out the diced apple for 2 cups of fresh blueberries. Fancy bananas? Exchange the apples for the same amount of diced banana and toss in a half cup of chopped, toasted walnuts for the apricots. Want to go one step further with that theme and make a Banana Split oatmeal? Add the bananas and walnuts, then stir in a handful of bittersweet chips just before pouring the mix into the pan. 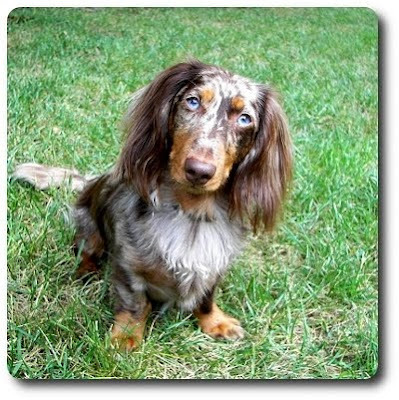 Gus loves his new backyard, but there has been one problem lately... it has been too hot to romp around and enjoy it! He gets some time early in the morning and late at night, but I think he misses his mid-afternoon run around. 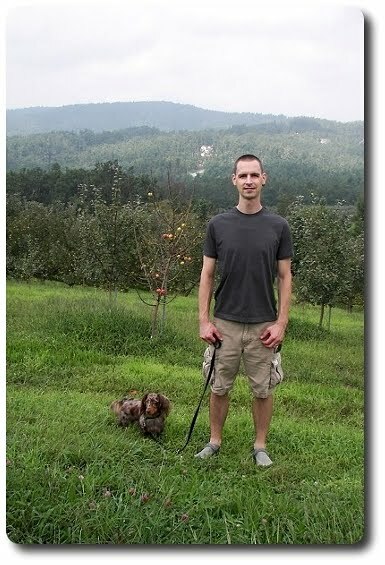 There is talk of cooler weather starting to work its way in, which I hope comes forth, as does Gus! Here's a snap of our happy pup just before he started chasing after a squirrel that dared enter "his" play area! I really need to try and get caught up on recipes we've already made, otherwise I'm never going to get them posted... so, here's my way! A few pictures, recipe links and short blurbs will have to suffice - if you have questions about any of these dishes, please don't hesitate to ask! Here's a salad we made a few weeks ago, during one of the (very) short cooler stretches of weather we've had over the summer. 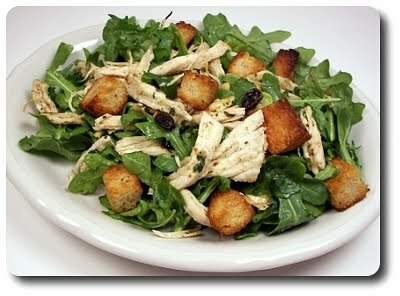 Crunchy homemade sourdough croutons, fresh peppery arugula, raisins, rich toasted pine nuts and a hearty amount of cooked shredded chicken were all tossed together, then dressed with a roasted lemon and garlic vinaigrette. 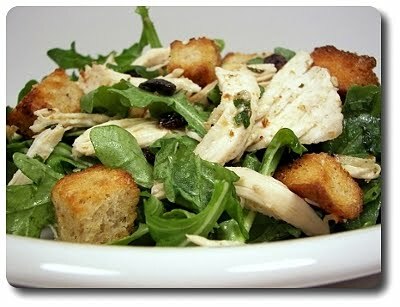 We thought this was a brilliant way to prepare and serve salad, especially the way you are directed to coat most of the ingredients with the dressing, toss them briefly into the oven to warm through, then jumble them together with the bright greens before being drizzled with the rest of the tangy vinaigrette. 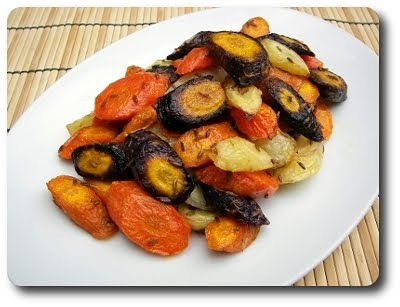 When carrots were abundant at the farmers' market, we were drawn to a certain busy vendor that had baskets overflowing with the most beautiful bounty of tri-colored bunched carrots all lined up, practically calling every person's name as they walked by. We didn't resist, along with everyone else, and ended up coming home with two large bundles. 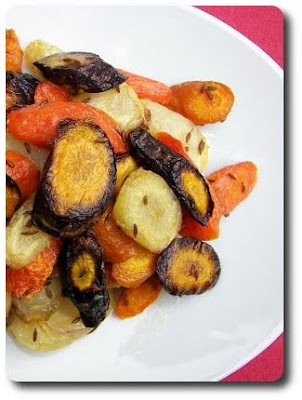 These simple roasted carrots are not only visually stunning and fun, but the addition of intense cumin seeds was a bit unexpected and definitely tasty. Speaking of salads, we also had this potato salad recently that Jeff was crazy about, mainly because he has been fascinated with goat cheese lately. Instead of using a mayo-based sauce, the warm potatoes are first tossed with a light extra-virgin olive oil vinaigrette, followed by an avalanche of tangy crumbled goat cheese. 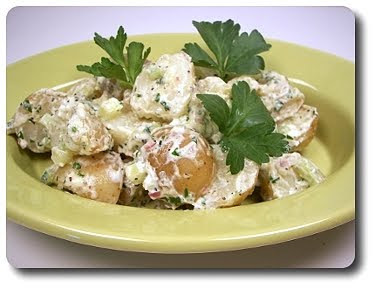 The heat from the potatoes melts the cheese, creating a creamy dressing that coats the salad well. With plenty of soft textures about, to give some contrast to the tender potatoes, a finely chopped stalk of celery and a small shallot were stirred in at the end, lending a pleasant textural crunch. 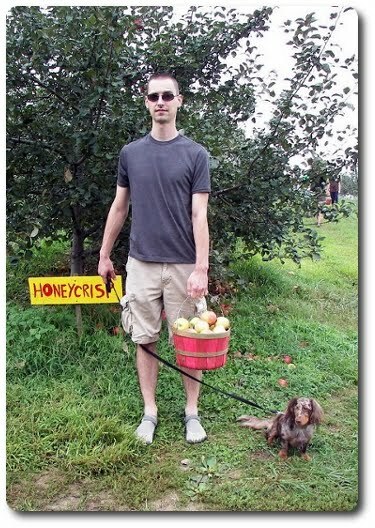 I was distracted at the market this weekend with a local vendor talking about honey and when I turned around to ask Jeff a question, he was gone! A couple minutes later I see him coming down the row, shuffling through the bustling crowd, with a silly grin on his face and a very large bucket of fresh blueberries! The first thing I asked him to do was stick out his tongue... yep, purple - he had already chomped down at least a fistful! Since we were now blessed with a ton of berries (with probably another ton in the freezer from a few weeks ago too), I figured I better find a way to work them into the Wednesday Treat Day this week. 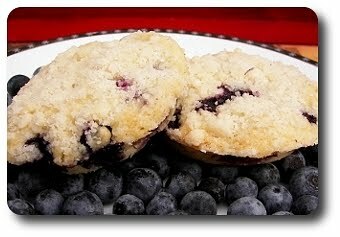 Thankfully this didn't take long as I knew exactly what I was going to do after coming across a recipe for these Blueberry Muffin Tops! 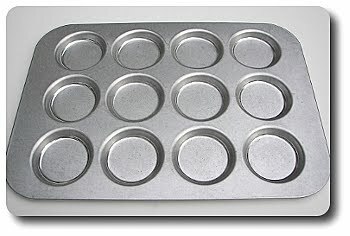 There was only one problem with my plan - we don't have a muffin top pan! We do, however, have this snazzy burger bun pan from King Arthur Flour that we've had for years. Now, the pan is not nearly as big as a muffin top pan, but the idea is the same - I guess we'll just have to live with calling them "miniature" Muffin Tops! The batter for these muffins is a bit richer than your ordinary everyday muffin, swapping out oil for liquid gold (aka melted butter) and tossing in an extra egg yolk. The original recipe didn't call for it, but since I quite enjoy the combination of blueberries and lemon, I thought it might be nice to stir a couple teaspoons worth of fresh grated zest into the mix. 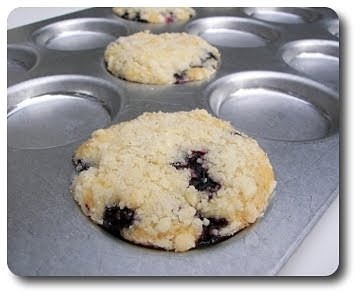 Just remember, as soon as you add the wet ingredients into the dry, stir just enough to barely combine the batter, then gently fold in the blueberries enough to distribute them throughout. If you're using a muffin top pan, divide the entire bowlful between the twelve wells - since I was using a smaller pan, I had to bake these off in batches. I wondered if the batter would start to lose its punch after sitting around for awhile, but it worked well. I did rinse the pan in cold water to cool it off faster, allowing me to knock out the next batch quicker. Before we baked the muffins, there was one more touch to the batter, making these tops an extra special treat - a groovy crumble! All that's needed for this is chilled butter cubes, granulated sugar and flour, all rubbed together with your fingertips to form small, alarmingly addictive nuggets. If you fancy a cinnamon hint in your blueberry muffins, don't be afraid to toss a pinch or two into this mixture. Once baked, give the muffins several minutes to rest in the pan before carefully transferring the hot tops to a wire rack to finish cooling down - they are fairly delicate right out of the oven..
You'll be rewarded with what you expect these tops should be - a bit crunchy, with a crumb-laden, buttery topping that sits upon a very bare base. There are no "stumps" (*wink*) underneath, but what happens to be there is tender, quite moist and chock-full of juicy blueberry bombs. 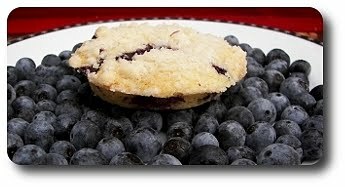 If you don't have either pan and still want to try out the recipe, divide the batter into a regular muffin tin - just keep on eye on them and check for doneness a couple minutes early, you may also not need all of the topping. Since the batter is on the thick side, you could also try using a large ice cream scoop to drop the batter onto large baking sheets, but they may end up spread out more than up. My mind did start to wander as we tested these out after dinner... since these are not absurdly large, how about tossing together a marshmallow-y (or maybe even cream cheese) type filling and sticking two tops together, making for a wacky Blueberry Muffin Whoopie Pie? Sounds like a fun experiment to me! 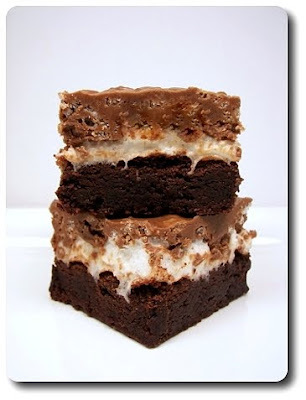 Oh my, I have another recipe to share that we made way too many weeks ago and never got a chance to get on the site! By too many weeks, I mean before we even left for Charlotte - we had made this Brown Soda Bread to snack on as we nervelessly awaited news on both house fronts. I'll try and keep this short and to the point as I need to get caught up on posts like this... I don't want to forget about them! This quick-to-make pantry staple (well, that rings true here as we tend to keep all of these ingredients handy!) bread had an interesting texture thanks to the dry ingredients used - whole wheat flour, all-purpose flour and those crunchy little nuggets known as steel cut oatmeal! 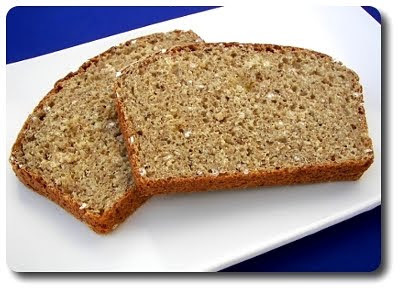 With whole wheat being in the majority here, the bread does have a hearty weightiness to it, yet it still rose well and doesn't come across as feeling like your eating a brick. There is just a bare amount of sweetness with only two tablespoons of brown sugar, but that left it as the perfect canvas for a smear of jam or a knob of butter with a drizzle of honey over the top. By leaving out a mess of added sugar, you'll also reap the benefit of being able to easily pair the bread a savory dish for dinner! 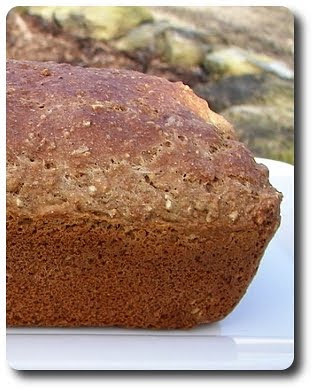 With a whopping two cups of buttermilk in this single loaf, I wondered how much of a tang we'd be left with, but it was pleasantly subtle with most of its power distracted into keeping the bread moist.